During the summer it occurred to us that there were a lot of motorcyclists riding around with cameras taking pictures. Bing! Let's have a photo contest and find out what's going on out there. So during a newsletter mailing for our online store, we revealed the contest and got hit with several hundred pictures. Below are the winners for the 2009 Sound RIDER! 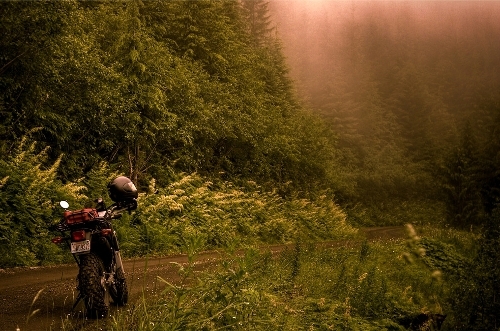 Northwest Motorcycle Photo Contest. We had so much fun doing it, you can look forward to it again in 2010! A software engineer living in the Puget Sound and a first year rider, Chris snapped this photo during a dual sport ride one morning on the Olympic Peninsula. The mist and the obvious wet road is a testament to what riding in the Northwest is all about. Even when the skies are dreary, a little patience can pay off with some stunning light and possibly a gorgeous afternoon. After getting a copy of the SR! Guide to Dual Sport Rides in Western Washington, Scott and a few friends decided to go ride to the highest elevation you can in Washington state. So it was off to Mazama and up to Slate Peak. But the weather took a turn for the worse and dropped a monsoon's worth of rain onto the dirt road below. By the time the riders began to head back, the road had washed out in several places which did not bode well for their new-found friend on a fully faired GL1000. Scott and his riding partners assisted the Gold Wing rider through several hundred feet of mud. Needless to say, we got a lot of submissions of riders' bikes by the side of the road. What we were looking for were shots that had a bit more dimension to them and in Will's we got that. An early riser sometimes gets a payoff with a beautiful sunrise and it makes the entire rest of the day that much better. Carry Potter and her husband Charles took a summer trip into Alberta and sent in a number of photos from the journey. 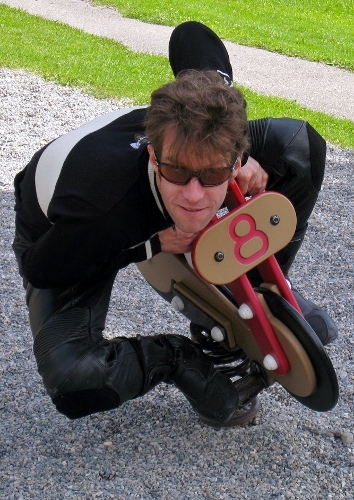 But this one was a standout because it portrays the kind of fun you can have off the bike. Well, we're not sure if Charles feels he's off the bike in the shot. 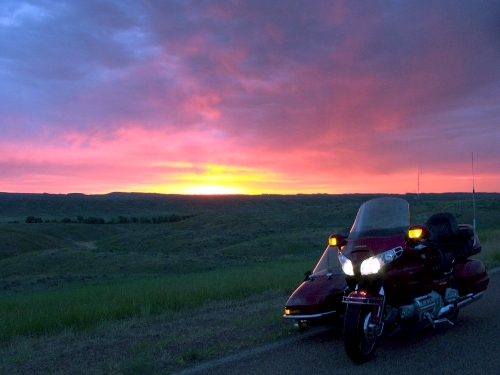 Riding motorcycles is fun, but we think it's what happens when you're stopped that makes the trip that much more fun. Patrick and another Yamaha 2 stroke enthusiast decided to take a ride. Here in the Northwest it doesn't have to be summer to have a great ride. The snow adds a dimension to the shot that blurts out what an adventure you can have getting out almost any time of year. Copyright notice: All images belong to the sole owners and may not be reproduced or copied in any manner without the written consent of the owners themselves.